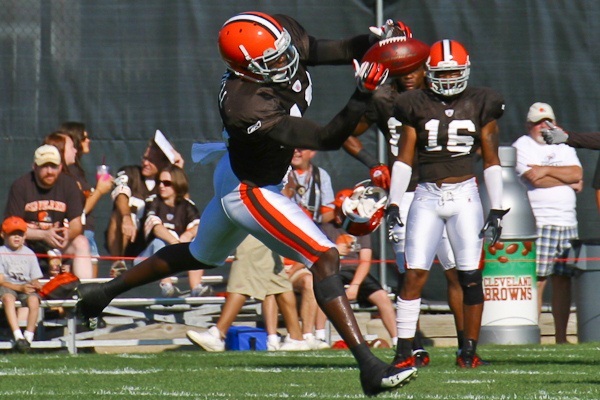 Find out why Browns WR Carlton Mitchell is potentially a beneficiary of the Browns draft. Photo by Hank. I don’t believe in grading the draft. Many of my colleagues, ones I respect a great deal, will be providing draft grades this week. Some of them will say that they don’t believe a draft can be graded accurately for a few years, but two paragraphs later they are grading away like they’re teaching middle school. The reason is they believe they are giving readers what they want, and they’re right. In this case, I don’t care. I’m not indulging in that practice. Although some may want to read it, perpetuating a practice that none of my writer brethren believe in but do it anyway is not something I have to do here. This is when I love having my own blog. I’m going to try something a little different and discuss what I think teams are trying to do with certain picks and whether I can see the logic. Remember, I will be donating 10 percent of all 2012 sales to the charity Darkness to Light to combat sexual abuse. Get this at no charge on Sunday, May 6 using the login and password you receiveto download the 2012 RSP. James represents the 49ers movement to stockpile big-play artists into its arsenal. Photo by Neon Tommy. One thing is easy to tell with San Francisco’s offseason acquisitions: they felt they were deficient in the vertical game. Randy Moss, Mario Manningham, A.J. 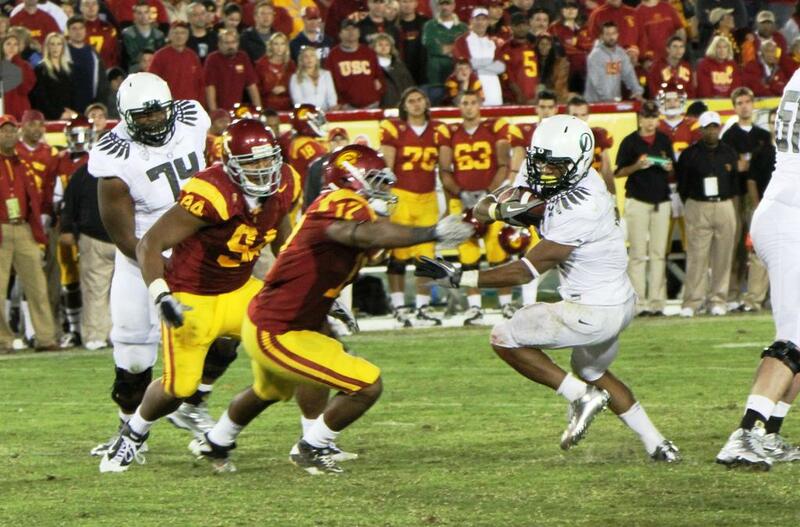 Jenkins, and Chris Owusu are all speedsters. At first glance I’d be surprised if the 49ers opt to spread the field and use 10- and 11-personnel sets as its base personnel, but the selection of Kendall Hunter last year and LaMichael James in this draft does indicate that they want runners that operate best in the screen, draw, and delay portion of the run game. Neither Frank Gore nor Brandon Jacobs are backs in the prime of their careers, so the youth movement with Hunter and James could indicate a subtle change with the philosophy in at least certain types of plays the team wants to run. However, the line hasn’t changed, so I doubt they’re going to veer far from what they did last year. The aim will be to enhance their offense with more explosive plays deep and in space. Consider the receiver additions as stockpiling to insure they hit one at least one of them. The Bears offense post-Martz is one I’m excited to watch. 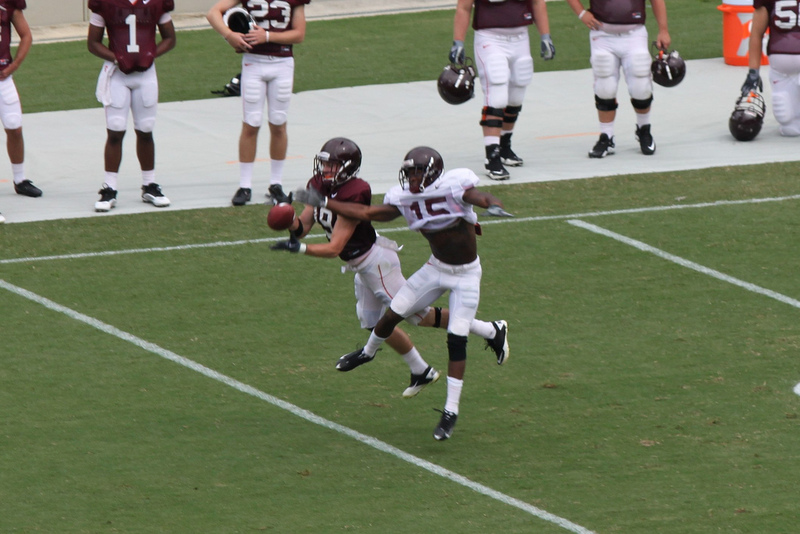 Tight end Kellen Davis is one of the players I anticipate monitoring closely. Chicago’s transition away from Mike Martz’s philosophy is one of the changes I’m anticipating the most in the NFL this year. Brandon Marshall and Earl Bennett are the type of players Jay Cutler can lean on when plays break down. I expect the offensive line to improve just from the sheer fact the team won’t be employing as many plays with deep drops as they did under Martz. What I can’t wait to see is if the Bears do more with the passing game with its tight ends. Kellen Davis and Evan Rodriguez may not be Rob Gronkowski and Aaron Hernandez, but they both can do enough to invoke those styles of play, respectively. 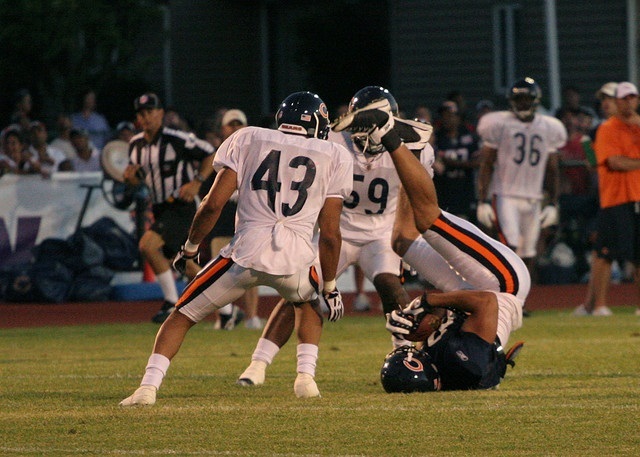 Rodriguez has flashed enough vertical skill that the Bears have stated they’ll use him as such. If he pans out, expect to see Rodriguez move around like Hernandez and create mismatches in the offense’s favor. Sanu isn’t a refined receiver, but his raw skills as a pass catcher are among the best in college football. He and Marvin Jones were excellent picks for the Bengals. Photo by West Point Public Affairs. Talk about stockpiling weapons on offense! Mohamed Sanu and Marvin Jones have the potential to become practically interchangeable as flankers or in the slot. Sanu is better after the catch, but Jones is the best route runner of this class. Jordan Shipley, who is coming off injury, demonstrated promise as a rookie. Even Kashif Moore is an intriguing down field weapon as a UDFA signing. Considering Jerome Simpson was an off-field concern, I think the Bengals upgraded its weapons outside even when losing their former draft pick from Coastal Carolina. If Orson Charles’ problems don’t extend beyond this DUI arrest after his Pro Day – which was clearly a stupid move on his part and deserving of his draft stock plummeting (if that, and not the fact he’ll never grow into a bigger tight end than he is) – then the Bengals also stole the tight end from Georgia. He’s a decent enough blocker to contribute in two-tight end sets that will allow Andy Dalton more flexibility to find mismatches at the line of scrimmage. This possibility of more two-tight end sets with one move-player to create problems for defenses appears to be a draft day trend. I’m surprised the Bills didn’t target more receivers this weekend. I thought T.J. Graham’s selection was higher than warranted, but compared to many speedsters that quickly flame-out, Graham has been diligent about working to become a hands-catcher of the football and I’ve seen him make plays inside the hash that keep me from writing him off as Craig “Buster” Davis 2.0. Denver must feel comfortable with its receivers because Eric Page and Gerell Robinson were the only additions this weekend and both were UDFAs. However, the overhaul at running back is underway. Two years from now, I could see Ronnie Hillman and Mario Fannin as the one-two punch in this offense. Keep an eye on Xavier Omon. He impressed late in San Francisco’s preseason. What I like about Brandon Weeden is his big arm. Bill Smith of Frying Pan Sports mentioned on his draft day podcast that receiver Carlton Mitchell didn’t see much of the field last year because he routinely outran Colt McCoy’s range on vertical routes. If this assessment is true, Mitchell might be the reason the Browns only added one receiver with true vertical skill in this draft, Miami Hurricane Travis Benjamin. In terms of potential, a trio of Little as the flanker, Mitchell as the split end, and Benjamin in the slot looks dangerous. Benjamin is a better route runner than I think some of my colleagues think and he’s a good return specialist they can develop to replace Josh Cribbs if necessary. Trent Richardson may be the highlight of Cleveland’s draft, but they did draft other components with value. I hope LaGarrette Blount has worked on his pass protection because Greg Schiano picked two backs in Doug Martin and Michael Smith that I know are willing to block and have the promise to do it well. Both of them hit the hole hard. Blount is on notice in this new regime. Arizona is hedging its bets at quarterback in the late rounds and I think Ryan Lindley is a good hedge. Like John Skelton, he’s a big-armed developmental project with starter potential. I believe he’ll easily become a quality backup within a few years. Jacory Harris makes sense as a Cardinals UDFA signing. If I’m correct, there’s a 2004 connection between Harris, former UM offensive coordinator-Steelers QB coach Mark Whipple, and former Steelers offensive coordinator-current Cardinals head coach Ken Whisenhunt. 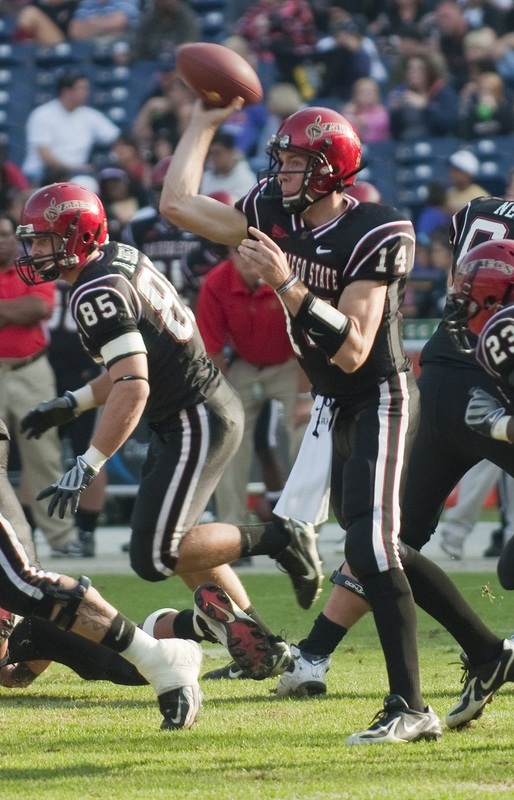 Whipple loved Harris’ mental acumen for the game and if Harris is correct that NFL coaches were surprised about his understanding of offenses during meetings then it’s not difficult to deduce that Whipple also relayed information to Whisenhunt that the former Hurricanes quarterback was worth a look as a free agent. Fans like to joke about Harris because his career seemed to go off a cliff, but I’ve seen Harris make throws and decisions that display NFL-starter skill. Consistency is the sticking point. Michigan State RB Edwin Baker landed in a great situation because the depth chart after Ryan Mathews is former Syracuse runner Curtis Brinkley, and LeRon McClain. Brinkley showed smarts and determination against the Chiefs last year in relief of Mathews and McClain is a good FB/RB ‘tweener. I think Baker could be a quicker version of Brinkley and challenge for the backup role. He’s a good receiver and another astute, low-cost option. I was initially confused by the Chiefs selections of Cyrus Gray and Devon Wylier until I thought more about Dexter McCluster. See below. 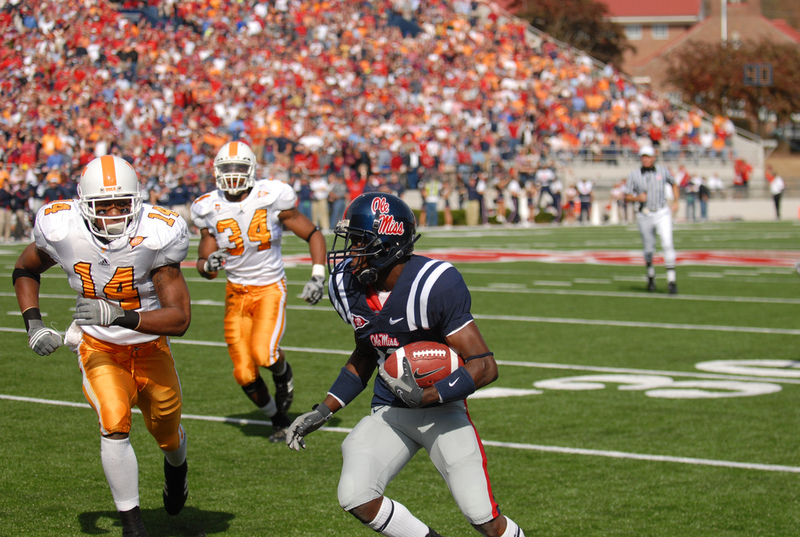 Photo by Tennessee Journalist Wade Rackley. I don’t know whether to be excited or confused about Kansas City’s selection of WR Devon Wylie and RB Cyrus Gray. Ultimately, it raises a lot of questions that come down to one root issue: What to do with Dexter McCluster? Is he a running back or is he a receiver? McCluster refers to himself as an OW (Offensive Weapon). I like that designation, but I don’t think the Chiefs have figured out what to do with him. If he’s a slot receiver and return specialist, then why draft Wylie, who might be a better one? If he’s a running back, why draft Gray, who has a chance to be just as effective? The best answer I can provide is continuity and depth. If the Chiefs plan to use McCluster as a bigger weapon in the future then they need to feel like they can fill the hole he’ll leave behind if he gets hurt. As small as McCluster is that’s a smart thing to anticipate. I think I just talked myself into being more excited. Indianapolis might be the best example of a team on the right track of developing a two-tight end attack that will work along the lines of New England’s offense. Landing the best two tight ends in this class will go a long way in making it happen – especially when they are complementary players. Neither Fleener nor Allen are as dynamic as the Pats’ duo, but the drop-off is negligible for the Colts designs to use them. But forget the tight ends for a moment and focus on the wide receiver depth chart. T.Y. Hilton, and LaVon Brazill are two of my favorite, lesser-known receives from this draft class. I think Brazill can become Wayne’s understudy in this offense if he’s willing and Hilton can learn the slot. Then there’s Jarred Fason and Jeremy Ross, two players with great after the catch skills and elite athleticism. If they can develop, this could be a loaded depth chart for the Colts. Odds are it doesn’t all come together, but even if two of these four young players hit, Andrew Luck will make Colts fans happy for while. Eagles fans won’t like this, but I think they would have been better off with Danny Coale. Photo by Techsports. Danny Coale will win the slot receiver role. He’s one of my favorite players in this draft. His game lulls you to sleep because Virginia Tech often used him on swing routes as a the slot receiver. Next thing you know he’s making third-and-long catches in traffic for first downs, breaking up the seam for a long reception, and snaring a clutch pass in the red zone. I liked Dwayne Harris’ potential last year, but I like Coale’s reality this year. Expect Harris and Kevin Ogletree to compete for kick return duty. I understand how tight end Michael Egnew will fit into this offense in theory, but I don’t think it will happen in practice. He’s not a good blocker and that’s something the Dolphins count on from Anthony Fasano, Jeron Mastrud, or Will Yeatman so logic dictates he’ll be a move-tight end. But Charles Clay demonstrated enough in that H-back role that maybe Egnew was drafted as depth. However, I think he’s way too tall to work out as an H-back.This decision bears further investigation. I love Chris Polk the player, but I’m beginning to wonder if I wasn’t alone in thinking (until now, privately) that his maturity was a factor in his fall from grace. Bryce Brown and Chris Polk are Eagles as of today. Philadelphia must covet a more physical run game where they can lean on its depth chart to deliver it. Polk was my No.5 RB in the 2012 Rookie Scouting Portfolio and I’m sure he was at least the top 7-10 runner in this class in most publications. His fall from a 2nd-3rd round value surprised everyone not privy to interviews. Polk’s lack of a photo-shopped body had to have turned off teams. It was easy to look at him and conclude he was not a worker even if that’s not completely the case. The shoulder surgeries also have to be a concern, although he played well this year. The degenerative hip is something Polk claims is a rumor. That’s over 25 percent of the starting backfields in the NFL with a reasonably strong history of staying healthy. There’s only one other reason that can exist that dropped Polk and that’s his character. I know little nothing about Polk off the field.Yahoo! 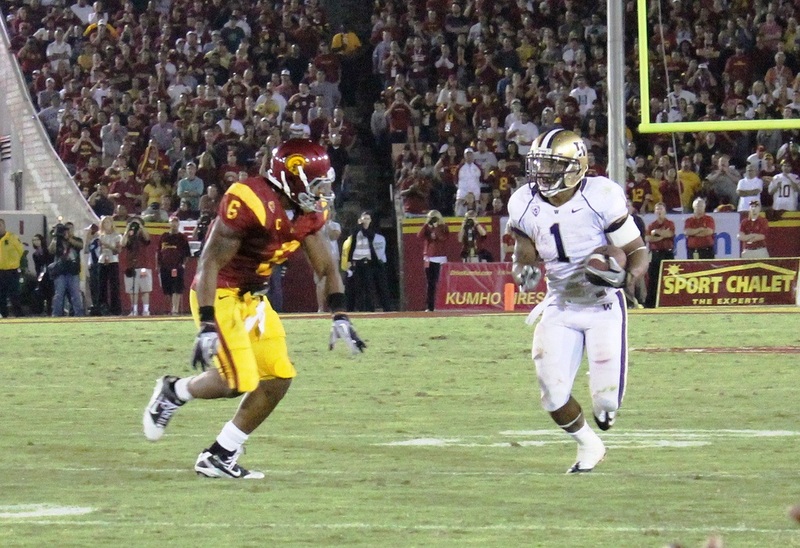 writer Doug Farrar says Polk was engaging whenever he talked with the runner in Seattle. I will reveal that I didn’t have that experience with my only interaction with Polk at the Senior Bowl. Monday night is a dinner with media and players in attendance. The Senior Bowl staff does a fantastic job of organizing this event and makes sure the players are given a chance to eat before the press is allowed to approach them for interviews. I’ve spent several years interviewing people in and outside of football. It’s what I do for a living. There are common sense signs that someone doesn’t want to participate in an interview. Lack of eye contact can be one of them. Short answers to open-ended questions is another. Facial expressions and body language can be another. These are not always 100 percent accurate signs, but you get a feel for when you’re getting someone not engaged in the process. To Fuller’s credit, he answered them with composure, humility, and intelligence. He also answered my questions without shutting down emotionally. I could tell he was tired and those questions weren’t easy for him. It was the same thing the year before when Jake Locker was surrounded by 4-5 reporters asking him the same basic question: “do you think you made a mistake staying in school?” LaGarrette Blount two years ago was accommodating despite slugging the Boise State player. So when I approached Polk, there was probably 10-15 minutes left and I ended our conversation after three questions because I felt like he had shut down. No eye contact, feet on a table, and facial expressions that just looked like this was the last place he wanted to be. I never mentioned anything about this publicly before the draft because I presumed Polk was just emotionally tired of interviewing and getting asked the same questions. I know I would be. However, I do wonder if this behavior was more pervasive than just with me at the Senior Bowl, because in a situation that is an extended tryout and job interview you should have the common sense to be on your best behavior. Apparently I was not alone when it came to observing this about Polk. Obviously, I can separate Polk the football player from Polk the personality. He was my No.5 RB in this class and I’m surprised he wasn’t drafted. However, this was a unique case where I felt the need to share what I learned about him at the Senior Bowl that I would otherwise keep to myself. Hopefully, he grows up a little more because he’s a heck of a running back and I’d like to see him succeed. No skill players of note this weekend that I feel like commenting on here. I’ll wrap up Part II tomorrow night.